Titan Bet comes from the same team as Titan Poker, one of Europe’s leading online poker rooms. Titan brings to sports betting exactly the same kind of quality and service that the poker site is known for.Available in four languages, Titan Bet allows punters to bet on a massive range of sports from across the globe. In fact, at Titan you can bet on the following sports: American football, athletics, Aussie rules, baseball, basketball, beach volleyball, boxing, cricket, cycling, darts, floorball, golf, handball, ice hockey, motor racing, rugby, snooker, soccer, table tennis, tennis, volleyball, winter sports.If that wasn’t enough, it is also possible to bet on the latest major entertainment events (such as reality television shows and award ceremonies) and worldwide political figures and elections. 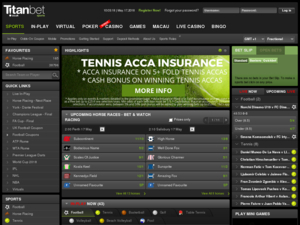 Visitors to Titan Bet should take a look at the ‘Sports Betting News’ section of the site. There are in depth articles available covering a huge range of sports. The articles discuss upcoming matches, team news, league overviews and offer loads of top notch betting advice.This is definitely the section of the site to visit before placing your bets. With a wide range of statistics and in-depth analysis available, there’s every chance you’ll spot a fantastic bet that you hadn’t noticed before. Titan Bet has developed a great mobile app that is compatible with both iOS and Android devices. The app allows users to bet on exactly the same sports and events as the website including in-play betting.Another great feature of the mobile app is the ability to view all sports results while on the go. If you’re travelling somewhere and want to check the outcome of your bet, you can quickly logon to the mobile app and find out if you’ve won.While the app is easy to use, it is slightly limited in that it is not possible to manage your account funds. In order to deposit or withdraw money it is necessary to use the desktop website.At the moment, newcomers to Titan Bet will receive a free £10 mobile bet upon joining the site. Titan Bet really specialises in live or in-play betting. For every major sporting event Titan Bet offers dynamic odds throughout the game.If you’re watching the match live, or out with friends enjoying a game at the local pub, then the live betting feature can really add excitement to the betting experience. You have the chance to react to what is happening on the field and place your bets accordingly. If you don’t mind taking a few risks then this can turn out to be an extremely profitable gamble. Whether you speak English, German, Russian, Spanish or Chinese you will be able to receive customer support 24/7 at Titan Bet.The Live Chat option on the site is an excellent way of getting quick answers; however, if you are looking for support in a language other than English it can take a few minutes for a representative to join you in the chat.There are also Freephone numbers for the UK and Canada as well as an international help centre which is manned by highly trained customer service representatives. If you don’t mind waiting a day or two for the answer to your question the best option is to email them. While it may take a little while to receive a response, you can be sure that it will be detailed and helpful. It doesn’t matter where you are in the world, at Titan Bet you are sure to find a convenient way of depositing money into your account. Of course every major credit and debit card is accepted as well as bank transfer. Additionally there is an abundance of eWallets and ePayment methods for you to choose from. Ranging from PayPal to Skrill to Yandex. Money there is sure to be something to suite you. There is a similarly impressive list of options for withdrawals.Titan Bet will process payments in numerous currencies, US dollars, Euros, British pounds, Canadian Dollars, Australian Dollars, Norwegian Krone, Russian Ruble, Swedish Krone and South African Rand.Of course, all the payment options are absolutely secure and will normally transfer your funds instantly. In short, WhoIsTheBestBookmaker.co.uk thinks that Titan Bet is a first-rate betting site. While it may not have as many in-depth odds as other bookies, it covers a truly impressively large number of sports and events making it an excellent bookmaker at which to place straightforward win/draw/lose bets.The mobile app is a great resource, and while limited, as long as there are funds in your account will allow you to place bets wherever you. This is particularly useful for in-play betting, wherever you’re watching a game, just bring out a phone and place your bet. While in many ways a simple bookmakers, Titan Bet will certainly not let you down.